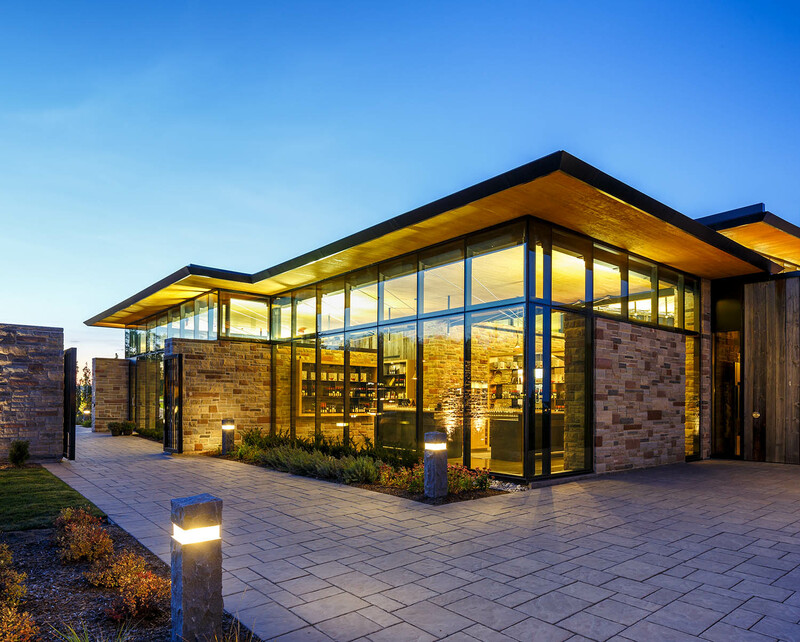 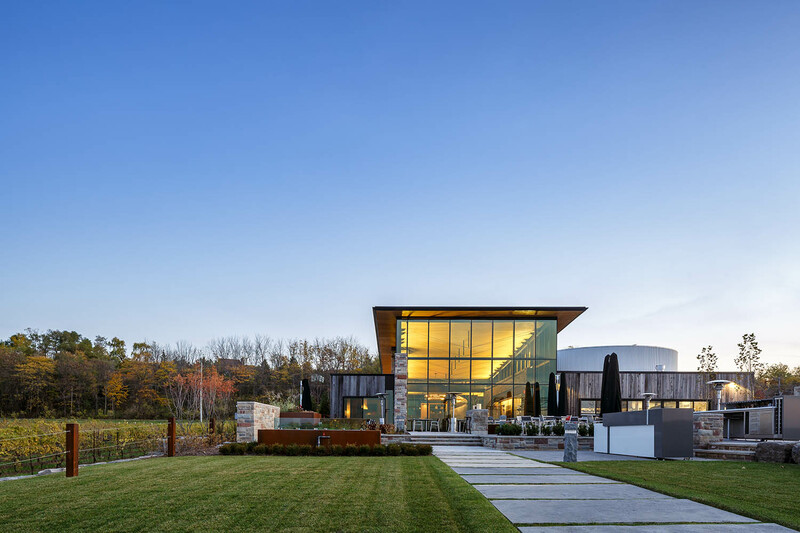 From the creators of famed Niagara winemaker Tawse Winery, their newest endeavour, Redstone Winery, is housed in a new, Ontario-rooted facility that combines a retail, wine tasting and restaurant program along with stunning views of the vineyard. 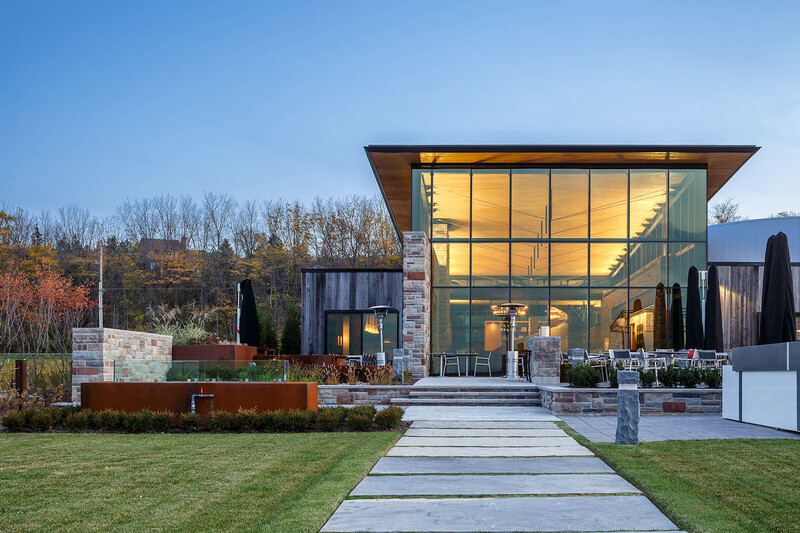 Nestled in the picturesque landscape of Beamsville along the southern shore of Lake Ontario, the Redstone Winery Restaurant and Hospitality Centre offers an inviting facility that includes a VIP tasting room, a seasonally-inspired restaurant and a patio overlooking the vineyard. 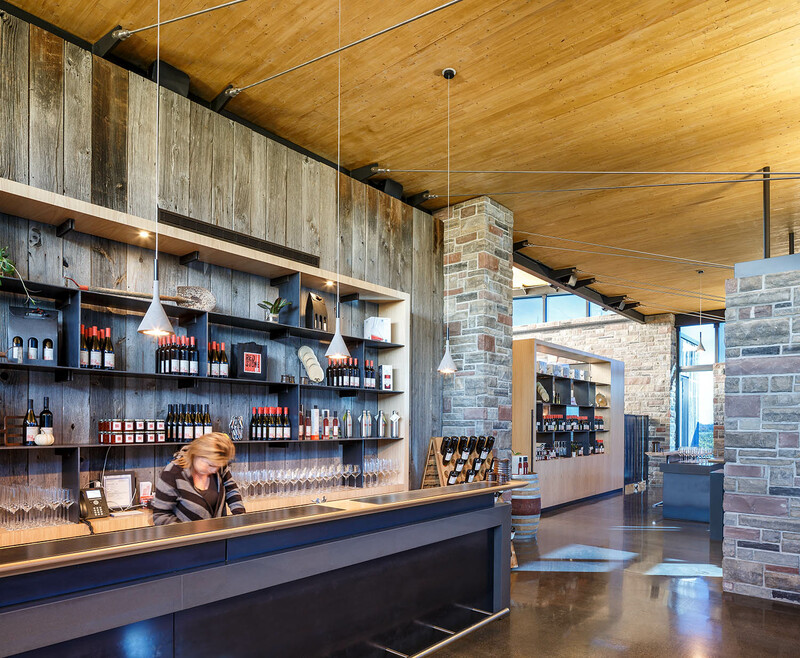 Conceived by Moray Tawse, the same mind behind the successful Tawse Winery, Redstone unites traditional wine-making techniques with state-of-the-art technology to create bio-dynamic, organic wines of exceptional elegance, depth and character. 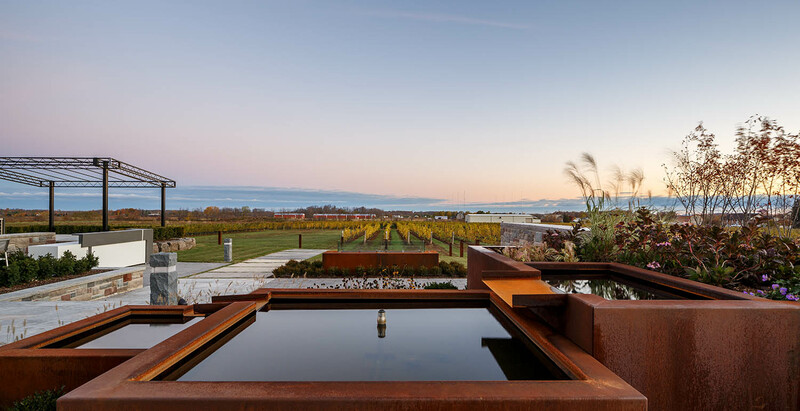 The design concept focuses on a seamless weaving of building and landscape—predominantly rows of grape vines. 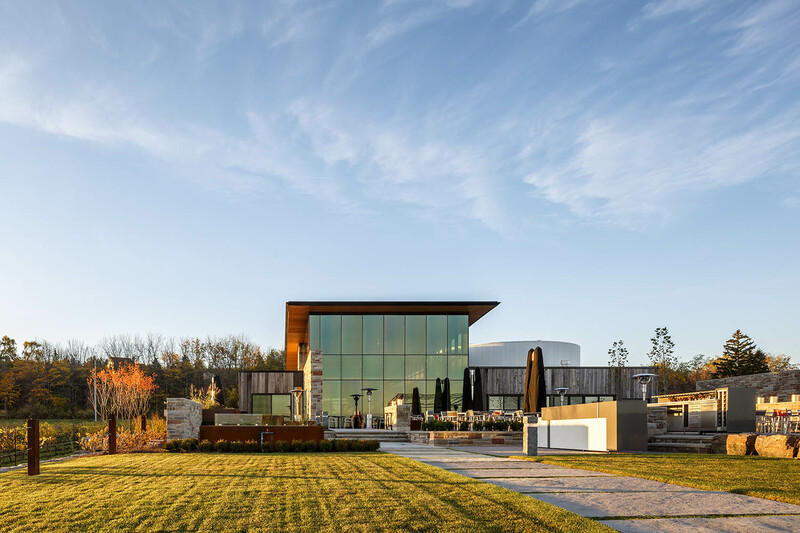 With a restaurant and a planned amphitheatre, it is designed to pull in visitors from Toronto—an hour away, and other provinces, providing them with a generous event space and a home-like environment to spend quality time with family and friends. 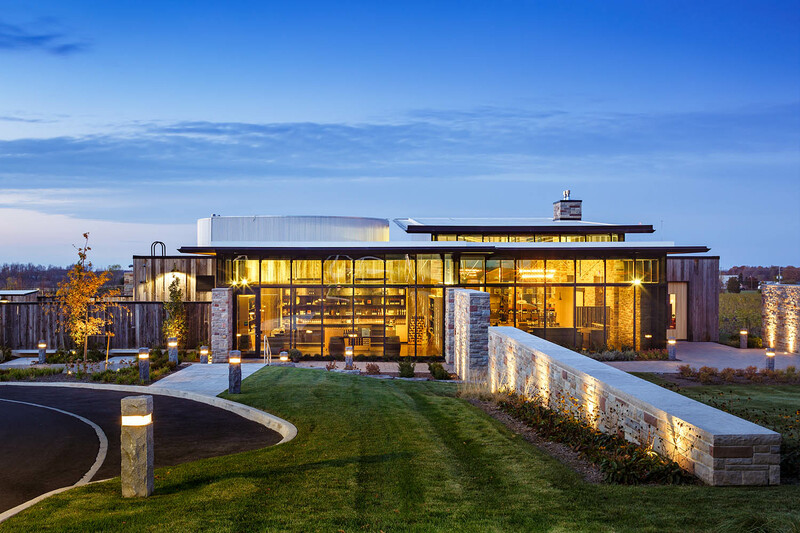 Inspired by its surrounding, the architecture responds to both the aspirations of winery and heightened passion for great food. 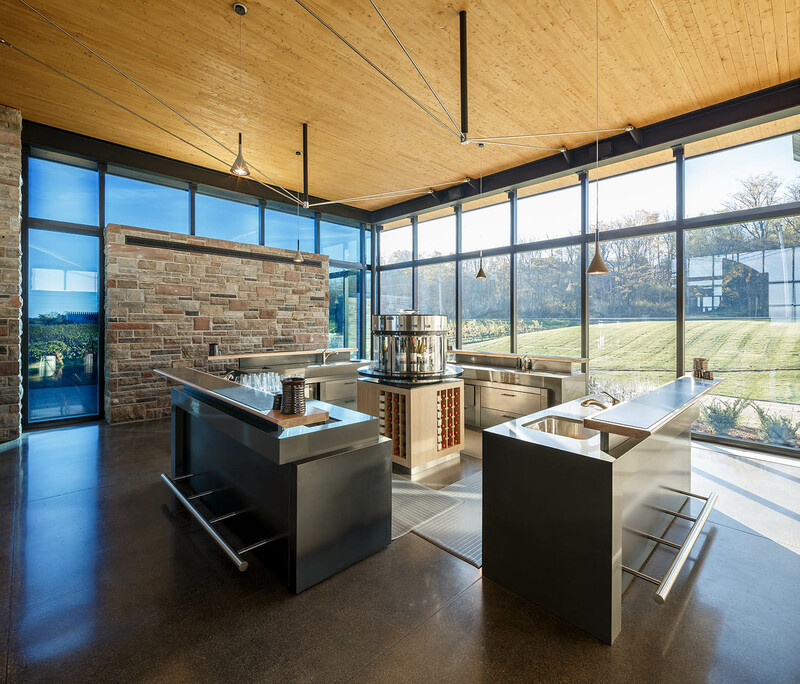 It combines a simple, natural material palette with innovative new technology such as “dynamic” glass that reacts to the solar conditions. 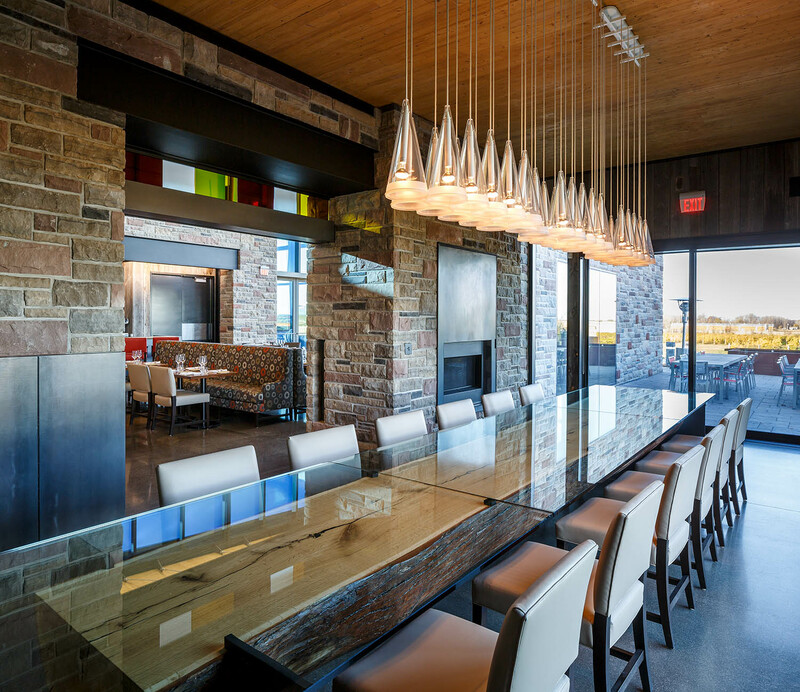 Together they provide unparalleled energy efficiency. 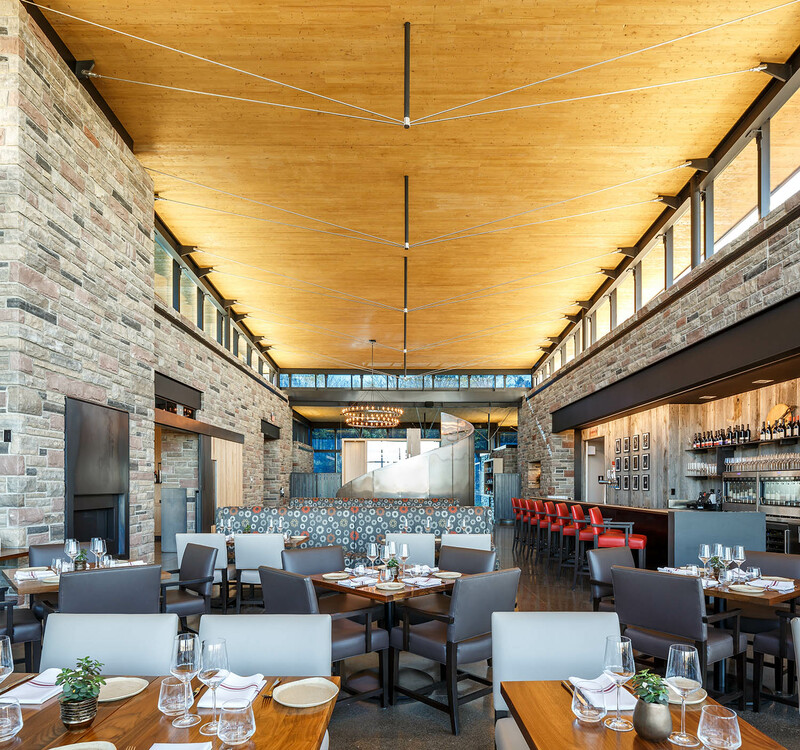 Moreover, the innovative Cross Laminated Timber (CLT) system, employed as both structure and finish, allows for welcoming, open spaces throughout. 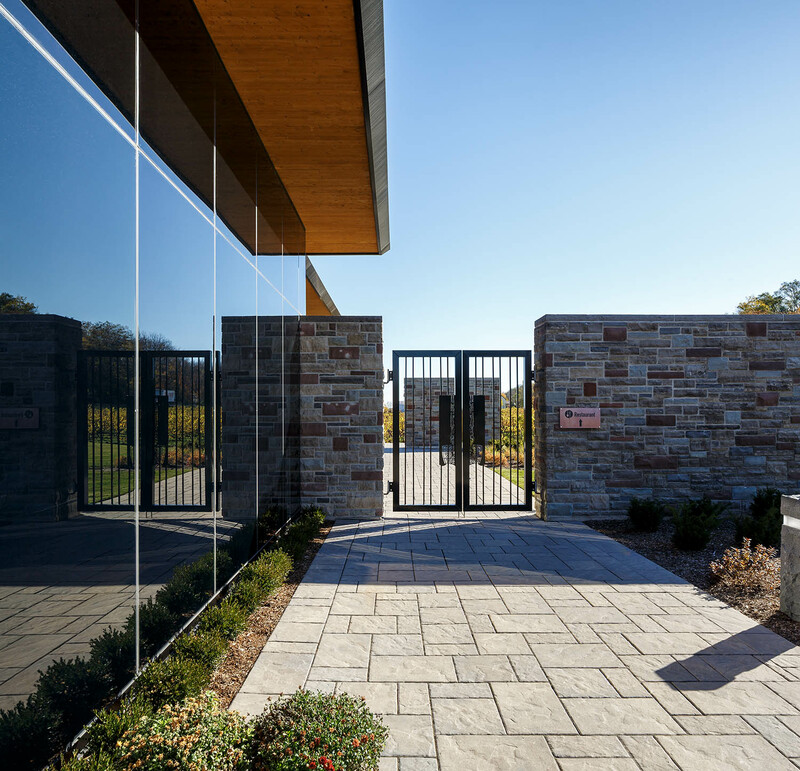 A series of fieldstone walls run parallel to the rows of vines recount the foundation walls of Ontario barns. 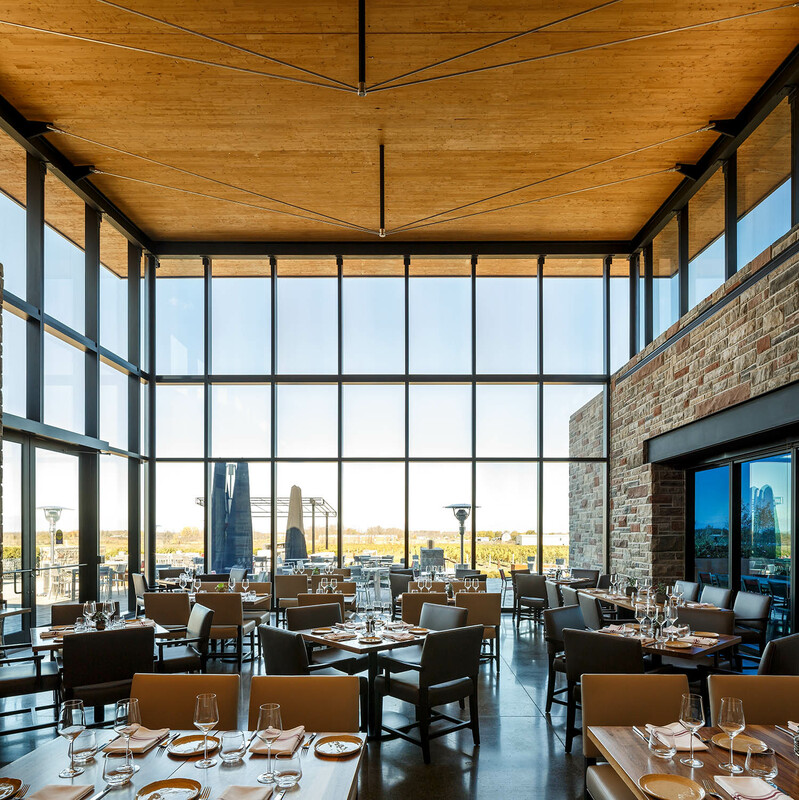 These walls frame the main Dining and Tasting Rooms, which are lightly bounded by dynamic “view” glass walls. 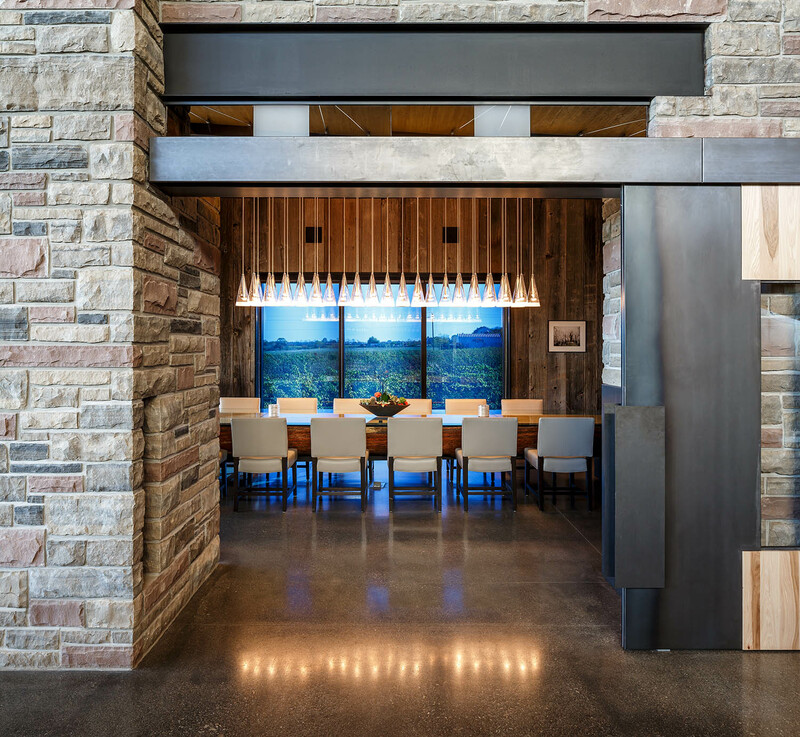 Simple volumes clad in reclaimed barn board and silo steel intersects the stone walls, enclosing space and defining routes for visitors. 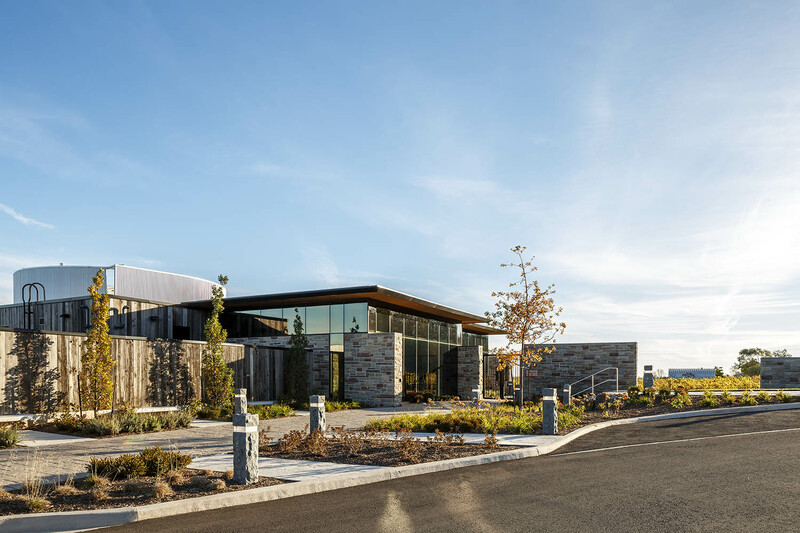 The other employed materials are those found in agricultural context—barn board and galvalume—and the forms are reminiscent of silos and long fence rows. 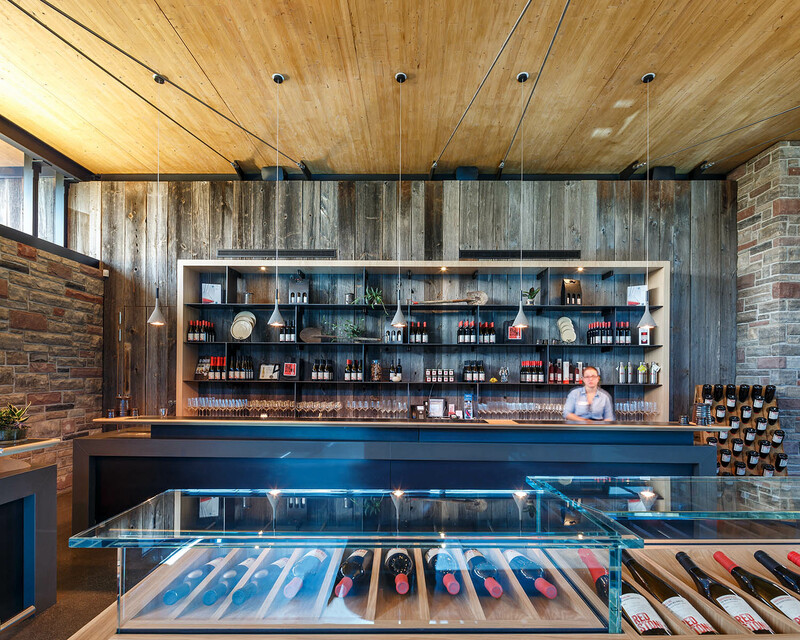 The scale and proportion of space heightens and enhances both the collective and personal experience of this wonderful place. 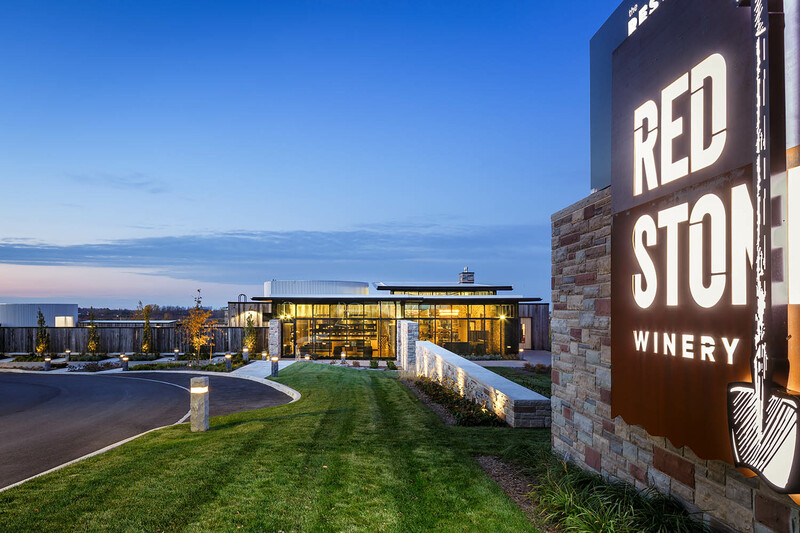 The opening of Redstone Winery marked only the beginning of its life—one that, much like its product, gets better with time.